June Scott, right, holds a picture of her son Walter. 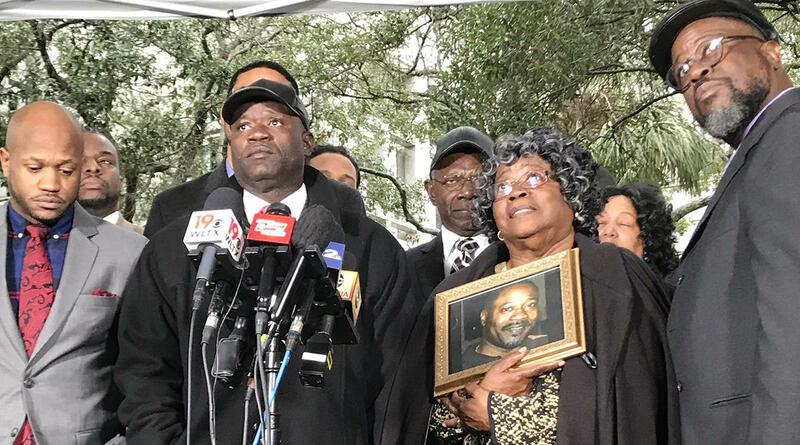 The family spoke to the press after the punishment was handed down Thursday in the federal sentencing of Michael Slager. It was a rare sentencing following a string of officer involved, racially charged killings across the nation. Thursday, a federal judge gave former North Charleston police officer Michael Slager 20 years behind bars for killing an unarmed man as he fled a 2015 traffic stop. The crime was caught on witness' cell phone video. Few officers in recent years have been convicted in such killings, much less received a lengthy punishment. Walter Scott's family hopes the sentence sends a strong message to police across the nation. "Stop and think or you could end up 20 years behind bars,"said family attorney Chris Stewart. "You won't just get away every time." Stewart was surround by several members of the Scott family as he addressed a throng of press, both local and national, following the federal sentencing. Attorney Justin Bamberg held up a less-than-$2.00 light bulb, saying Walter Scott lost his life "for this." He had been pulled over for a broken tail light. 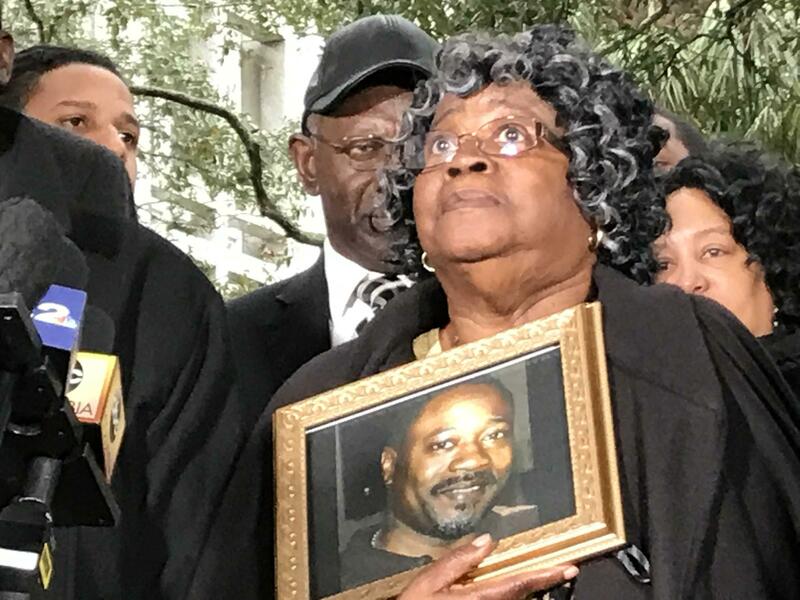 Walter Scott's mother, Judy , clutched a picture of her son as she told the media her soul rejoices. Just hours earlier, she had expressed to the judge how much she misses her son. She later turned to face his killer saying, "Michael I forgive you." Slager shackled and in a striped jumpsuit appeared to mouth the words, "I'm sorry". Judy Scott quietly said, "I know". Michael Slager's family had addressed the court too. His father Tom spoke about his son's commitment to serving the community, including time in the Coast Guard. Slager's wife acknowledged the Scott family's loss. "I think about you everyday and I always will," said Jaime Slager. She gave birth to their son while her husband was in prison. Before delivering his decision, U.S. District Judge David Norton said just punishment is in the eyes of the beholder. He said Slager had lead a spotless life, but added he must deliver a sentence that reflects the serious nature of the crime. He gave him 20 years. Four days of federal testimony and a lengthy state murder trial that ended in a hung jury lead to this moment. US District Court Judge David Norton had to decide what several jurors could not. Did Michael Slager commit murder when he shot Walter Scott? Or was it manslaughter as the defense has long argued? Those were the underlying crimes Judge Norton had to consider in sentencing Slager after he pleaded guilty to a federal civil rights charge. That crime carries any where from no time behind bars to life. The defense wanted less time. Crucial to the case was witness cell phone video taken by Feidin Santana. The young man was on his way to work on the morning of April 4, 2015, when he saw Scott running and Slager chasing. He grabbed his phone and began to take video. What he captured stunned a nation. The North Charleston officer fired eight shots while Scott fled, his back turned. The 50 year old fell to the ground. Slager picked up his dropped taser and placed it near Scott. The defense said the blurry shot of the two men on the ground told the real story. They argued Scott had wrestled with Slager and taken his taser. They said he feared for his life and acted out of self defense. But both state and federal prosecutors said no. There was no fight. Scott had run after being pulled over for a broken tail light. He did not take the officer's taser. The shooting was unjustified. What's more, they said, the officer obstructed justice by moving the taser and lying to investigators. Ultimately Norton agreed with prosecutors. He found the underlying offenses to be second degree murder and obstruction of justice. He said sentencing guidelines gave him a range to consider of 19 to 24 years behind bars. He took into account victim impact testimony and Slager's extreme conditions in prison. The 36 year old been kept in isolation for 15 months, away from the general population because of intense media exposure. Slager's attorney says he's been vilified in the public eye. With the verdict came challenges that both the families involved in the case and the community must now face: where to go from here? Jamie Slager says she will wait for her husband to get out of prison. Their son, now a child, will then be a man. The Scott family says they will continue to try to heal. They say they've watched their loved one's last run thousands of times, referring to the cell phone video of the shooting. Walter Scott's son Miles was on the phone with his father at that very moment. He left the courtroom in tears during sentencing. As for the community, there were no protests. Local civil rights leaders sat in the federal courtroom for much of the week. They have said that they are pleased with the sentence, but cautiously so. They say there is still more work to be done to protect other families, like both the Scotts and the Slagers, from so much pain.